1. Preheat the oven to 200°C, gas mark 4 and line a 30 x 20cm Swiss roll tin with baking parchment. 2. For the sponge: whisk the eggs and sugar in a large bowl using an electric hand whisk until they are very pale and fluffy. When you lift the beaters out of the mixture, it should leave a thick trail that takes a few seconds to disappear. This will take about 5-7 minutes. 3. Beat in the treacle and honey until incorporated. Sieve over the flour and spices and fold gently until no pockets of flour remain. 4. Pour into the prepared tin and spread right into the edges. 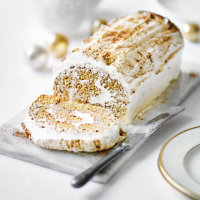 Bake the roulade for 10-12 minutes until firm and springy. Leave the sponge to cool for a few minutes, then turn out onto a piece of baking paper dusted with icing sugar. Peel off the top layer of parchment and roll the sponge up tightly, starting at one of the short edges. Leave rolled up and set aside to cool completely. 5. To make the buttercream, place a medium saucepan with a few centimetres of water in it on the heat and bring to a simmer. Place the egg whites and caster sugar in the bowl of a stand mixer (or a large mixing bowl, if you don’t have a stand mixer) and place the bowl over the simmering water. Stir the eggs and sugar together using a hand whisk for a few minutes, stirring all the time, until the sugar has completely dissolved and the egg whites are warm. When you rub the mixture together between your fingers, you shouldn’t be able to feel any grains of sugar. 6. Attach the bowl to the stand mixer and beat using the whisk attachment (or using a handheld electric whisk) until the whites form stiff, glossy peaks. Continue until the bowl feels cool to the touch. With the mixer on a slow speed, add the butter a tablespoon at a time. Wait a few seconds between spoonfuls for the butter to be fully incorporated. Continue to beat for 5-10 minutes until the buttercream is smooth and silky (it might look curdled at times, but keep beating and the mixture will come back together). Fold in the salt, melted chocolate and ginger syrup and beat again. 7. Unroll the Swiss roll. Spread half the buttercream over the sponge and roll up. Cover the outside of the roll with the remaining buttercream using a palette knife. Sprinkle over the cinnamon and ginger before slicing and serving.